« When your cat suddenly doesn’t use his litter box. All you’ve been doing is using pet odor removal products to clean up the mess! Positive reinforcement is the single most popular method for teaching dogs to obey human commands. Harsh punishment and intimidation are more than inhumane – they create a suspicious, fear-based relationship between owner and pet. On the other hand, rewarding a dog with a treat or a scratch on the back provides incentive for him to repeat that behavior in the future. Bear in mind that most dogs are food-driven, and they will do whatever it takes to chomp on some dog treats. 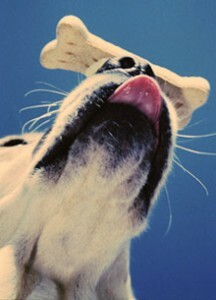 Once you’ve found the type of treat – whether it’s rawhide bones or a chewable bite – that appeals to your dog, use it as the go-to reward. Since dogs don’t have the same ability to associate actions with consequences well after the fact, you should reward good behavior immediately. This entry was posted on Monday, March 15th, 2010 at 1:49 pm	and is filed under Dog Treats, Pet Supplies. You can follow any responses to this entry through the RSS 2.0 feed. You can skip to the end and leave a response. Pinging is currently not allowed.